Barack Obama will be inaugurated as President of the United States tomorrow, the first black man to take the nation's highest office. Obviously, that begs the question: Who was the first black video game character? Vintage Computing and Gaming's Benj Edwards thinks he's found the man, the "Jackie Robinson of video games," in Atari's Basketball for the Atari 800. Perhaps a bit stereotypical, but this was 30 years ago. Still, the first man of color — with that color not being inhumanly purple or lime green — to appear in a sports video game may be the anonymous solo player for the Visitors. Sure, there had been plenty of black video game characters represented in game box art. 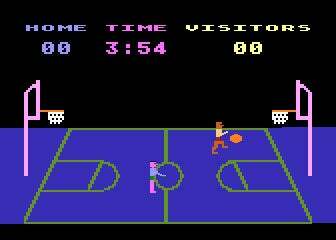 Even the Atari 2600 version of Basketball features an ethnically diverse team that predates the Atari 800 version, but in-game? We're going to default to Mr. Edwards' expertise on this one and look to "John Q. Basketball" as a pioneer.